Boxcar Books and Community Center Inc. and The Midwest Pages to Prisoners Project exist to promote reading, self-education, social equality, and social welfare through increased accessibility to literature and workshops – and the promotion of a community to support these projects. 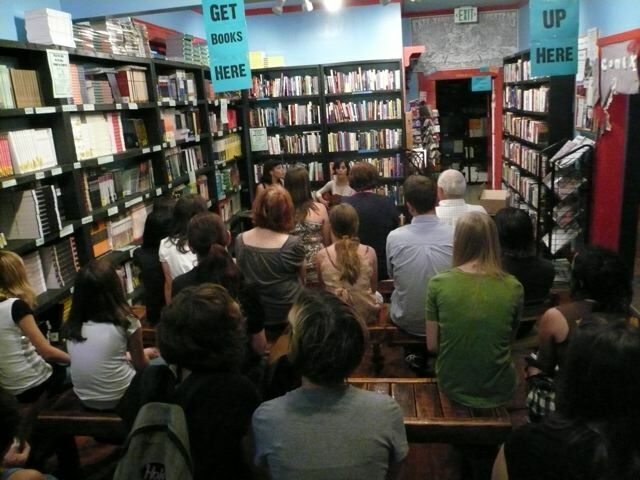 Boxcar Books is a non-profit, and as such, we rely on donations to survive! If you can, and you want to help out Boxcar, one way you can contribute is monetarily. Click below to donate! 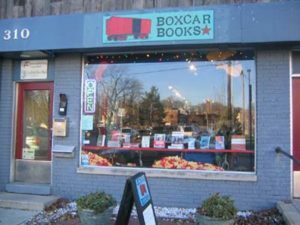 Boxcar Books and Community Center Inc. began as an idea between Oliver Haimson and Matthew Turissini for a bookstore, a community meeting space, and a new home and legal entity for The Midwest Pages to Prisoners Project in September of 2001. At that time the Midwest Pages to Prisoners Project, a group that sends books free of charge to prisoners in many states via in-person mail requests, had been in existence since 1995, had moved between four different spaces, and was in the process of looking for a new home. Matthew and Oliver had been involved in a collectively-run infoshop called Secret Sailor Books, which for several years was located at 202 North Walnut Street (now home to Landlocked Records), and was coming to the end of it’s lifespan. 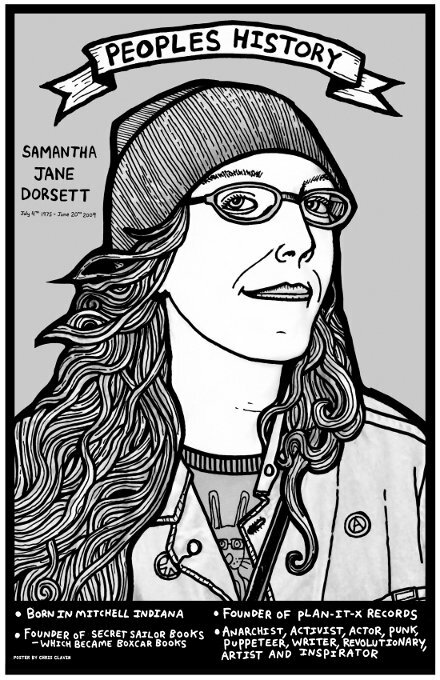 Secret Sailor was founded by Samantha Dorsett, who also co-founded Plan-it-X records. Boxcar Books eventually received some of Secret Sailor’s stock, as well as knowledge on running a bookstore and infoshop. In many ways it was considered Boxcar’s predecessor. Over the next few months, Matthew and Oliver asked four other people to be on the board of directors, began to file for legal status as a 501(c)3 tax-exempt non-profit of Indiana, looked for spaces, saved up the money needed to start the space, planned a budget, and began collecting inventory for the store. 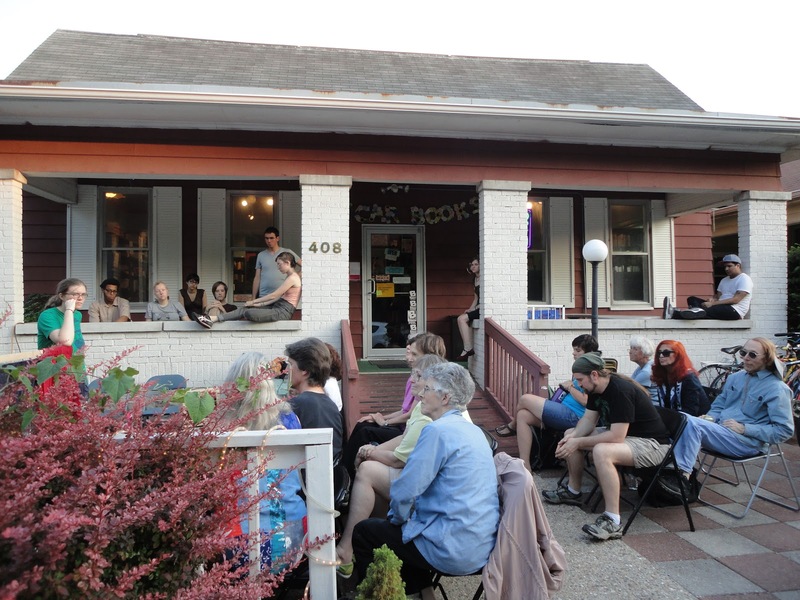 In January of 2002, Boxcar Books and Community Center Inc. began renting a space to house all of its projects at 310 S. Washington St in Bloomington, IN. 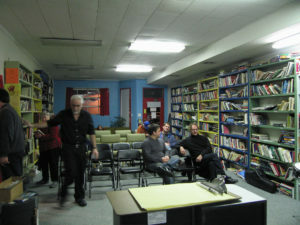 On February 1st, the bookstore and meeting space opened for business, offering books, zines, and magazines on topics not found in other bookstores. 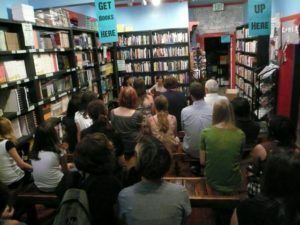 Boxcar has always carried books with a focus on issues of prison abolition, anarchism, LGBTQI studies, by authors of color, and representing those who are underrepresented in the larger culture. The new space enabled Boxcar to begin taking in a stable income for Pages to Prisoners various operating costs, as well as having a free and public meeting space for community events and groups to use. Boxcar was organized as a non-profit with a board of directors, which cedes almost all daily control and decision making to a collective of Boxcar volunteers. Once a volunteer has done several training shifts and gotten a feel for the works of Boxcar, they are given the option of joining the collective decision making body. Although different tasks are delegated to coordinating positions (financial coordinator, volunteer coordinator), the bulk of all decisions are made via consensus amongst this collective of people, which has varied from as small as 6 to as large as 20+ at different points in time. Midwest Pages to Prisoners has it’s own collective structure that operates separate from Boxcar, although both organizations often have regular contact and crossover in membership. 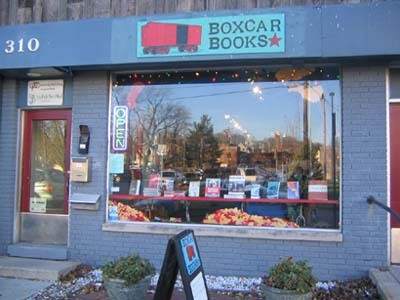 Boxcar stayed at the location near 2nd and Washington Street for 6 years, increasing its stock of books and eventually expanding to sell textbooks for select classes at Indiana University. At that time, Boxcar also briefly had a video check out service. After a few years, Boxcar began renting the retail space next door and expanded into it, doubling its size in order to create a better working space for Midwest Pages to Prisoners, and to have a larger open space for Community Meetings. Boxcar also began to have regular art shows in the space. In Spring of 2008, the City of Bloomington informed the residents of Boxcar’s building that they intended to bulldoze the block to make space for a new City of Bloomington Transit Center. Boxcar was notified of the need to find a new space to rent, and given some funds from the city to facilitate the move. After an extended search, Boxcar began renting the building at 408 East Sixth Street. 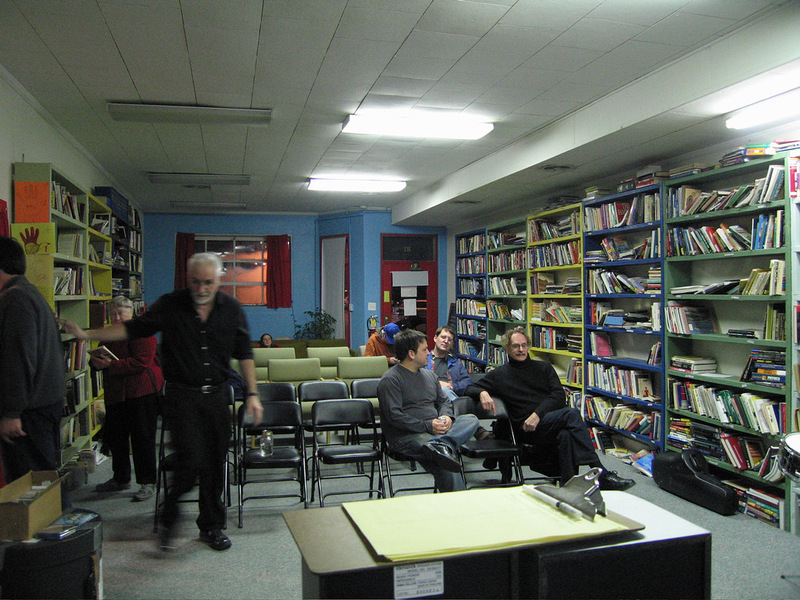 Boxcar reopened in August 2008 in the new location with a greatly expanded shelf capacity, keeping our commitment to being a meeting space, community center, and infoshop. At the time Boxcar moved into the new space, the Midwest Pages to Prisoners project split into a separate space on Rogers Street near 4th. Boxcar continued to pay the rent of Pages to Prisoners, collect books as donations to the project, and in all other ways continued to be financially and legally linked under one non-profit umbrella. Over the following years, Boxcar greatly expanded its offering of textbooks for Indiana University classes, and was able to hire a book buying position, and eventually a financial position. For several years during this time we were able to offer a small book scholarship to students who were undocumented immigrants and unable to receive financial aid due to Indiana state law. However, from 2010-2013 Boxcar continuously saw less profit from carrying textbooks, and we began to feel that the investment of time and work into selling textbooks, even when it was for social justice classes that fit with Boxcar’s mission, was not worth it. Fall of 2013 was the last semester for which we ordered textbooks for classes, and after that we returned to our focus to non-textbook books and zines. The book buying position was eliminated. Eventually the financial position was also phased out and now Boxcar is 100% volunteer run again. After freeing up space by discontinuing textbooks, in Summer of 2014, Midwest Pages to Prisoners was able to move into the Boxcar Books space, returning to the original arrangement of two organizations under one roof. Since it’s beginning, Boxcar has hosted thousands of events, public meetings, poetry readings, skillshares, film screenings, and protests. We have received tens of thousands of donated books. 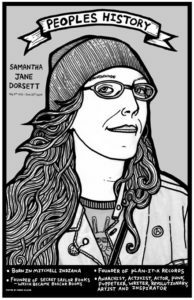 We have given display and shelf space to local authors, very small run zines and chapbooks, and countless important issues. We’ve been a space for public banner drops on pertinent and lesser known issues, and an organizing spot for radical organizations. We’ve also sold a lot of books! We are always looking for new volunteers. Please get in touch if you’d like to help continue the long history of Boxcar’s involvement in the Bloomington community and create its future! Right next to The Runcible Spoon Restaurant! Parking is available behind the bookstore. We welcome folks to use the parking lot instead of adding money to the parking meters, which fund additional police patrols and surveillance. We just ask that folks limit use of the parking spaces to one or two hours so that others may also use the lot.